In the taxi business it is important to understand that one of the ways to gain competitiveness on the harsh taxi market is the informatization of the operations that allows for a better efficiency in operating taxi services. Our company has equipped the Ljubljana Taxi dispatch center that operates non-stop, 24 hours a day, 365 days a year. Dispatch center faces periods with a high number of customer calls. Customer calls, both stationary and mobile, are distributed to dispatchers in accordance with protocol. The program assures, that the customer, that called first, is the first one to be served. 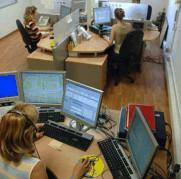 Call center allocates calls to one or more dispatchers based on even agent load. This features are enabled by the Call center software in connection with a professional communication server Siemens Hipath. Orders gained this way are then handed over to the taxi drivers by the NDC-Dicom++ radio system. All the conversations are recorded to ensure a better service quality. In smaller taxi dispatch offices the phone conversations are recorded by the LRPersonal recording system, and in larger taxi dispatch centers the use of LRProfessional is advised. Call recording gives the dispatcher a chance to double-check the received taxi order, if in the times of high call density a fact is misheard. Call recording can also help in handling customer complaints and supervising the quality of dispatcher's service. The main part of the dispatch center ICT is the taxi ride database, that is used by the program Taxi3000dispatch. This program allows easy invoicing of companies with a contract for taxi services. The Taxi3000dispatch program notify dispatchers regarding pre-orders on time. The program is directly connected to the telecommunication network so that it can automatically retrieve and store the callers numbers. This enables an easy callback in case of complication with the order. If the taxis are equipped with a suitable GPS device, it is possible to directly oversee the state of individual vehicles over the region, covered by the taxi company. 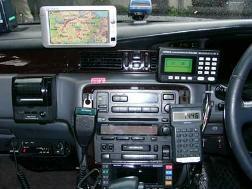 Software solution Taxi3000dispatch is also expandable in many other ways. Fundamental advantage adds a module that enables automatic route dispatching to the closest free taxi driver, in the case that dispatcher enters locations through the geo-location system. With a special algorithm the dispatcher can then electronically dispatch the route data to taxi vehicle. An example of the GPS positioning with data connectivity hardware is introduced on the picture below. From electronically gathered data it is possible to create a variety of accurate statistical data, that enables taxi management to make quality business decisions.